Grapes (Vitis spp.) are economically the most important fruit species in the world. Over the last decades many scientific advances have led to understand more deeply key physiological, biochemical, and molecular aspects of grape berry maturation. However, our knowledge on how grapevines respond to environmental stimuli and deal with biotic and abiotic stresses is still fragmented. Thus, this area of research is wide open for new scientific and technological advancements. Particularly, in the context of climate change, viticulture will have to adapt to higher temperatures, light intensity and atmospheric CO2 concentration, while water availability is expected to decrease in many viticultural regions, which poses new challenges to scientists and producers. With Grapevine in a Changing Environment, readers will benefit from a comprehensive and updated coverage on the intricate grapevine defense mechanisms against biotic and abiotic stress and on the new generation techniques that may be ultimately used to implement appropriate strategies aimed at the production and selection of more adapted genotypes. The book also provides valuable references in this research area and original data from several laboratories worldwide. 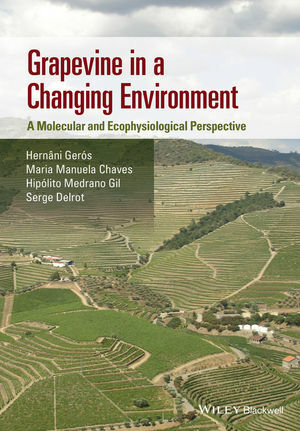 Written by 63 international experts on grapevine ecophysiology, biochemistry and molecular biology, the book is a reference for a wide audience with different backgrounds, from plant physiologists, biochemists and graduate and post-graduate students, to viticulturists and enologists.